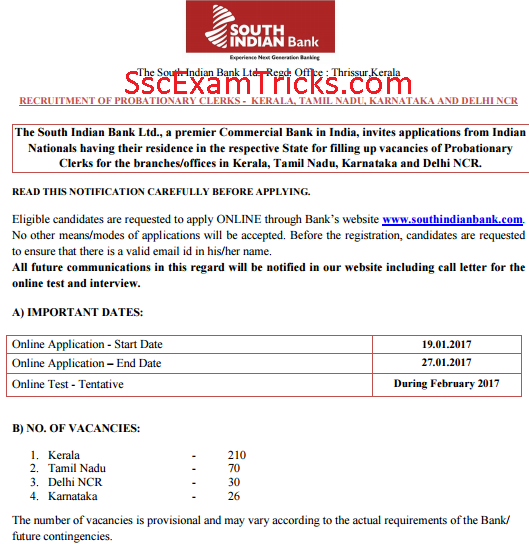 South Indian Bank Admit Card 2017 – SBI PO Clerk Hall Ticket 2017 - www.southindianbank.com. 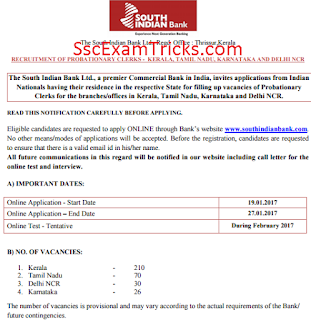 South Indian Bank (SIB) has all set to organize online test in February 2017 for 537 posts of Probationary Officer and Probationary Clerk. The SIB PO Clerk Admit Card 2017 will be uploaded in the end of January 2017 or in the start of February 2017 for the examination. Huge numbers of aspirants are going to attend this online test. Earlier SIB had invited applications for these advertised posts from 19th to 27th January 2017. The South Indian Bank will made final selection on the basis of performance in online test and interview. The cut off marks will be assessed to shortlist the candidates for interview. The final merit list will be prepared and appointment will be distributed based on marks of written nd interview exams. Those candidates who are going to attend this online test for PO and Clerk; they can download their South Indian Bank Admit card 2017 from direct link given here. 1. Visit to the official website and click on the career section or click on the direct link given at the bottom. 2. Check the direct to be displayed as ‘Download Admit Card’. 3. Enter registration details and press ‘submit’ button. Your online hall ticket for South Indian Bank PO Clerk Exam 2017 will be downloaded which can be printed for the examination.